Claims made in many Music Information Retrieval (MIR) publications are hard to verify due to the fact that (i) often only a textual description is made available and code remains unpublished – leaving many implementation issues uncovered; (ii) copyrights on music limit the sharing of datasets; and (iii) incentives to put effort into reproducible research – publishing and documenting code and specifics on data – is lacking. In this article the problems around reproducibility are illustrated by replicating an MIR work. The system and evaluation described in ‘A Highly Robust Audio Fingerprinting System’ is replicated as closely as possible. The replication is done with several goals in mind: to describe difficulties in replicating the work and subsequently reflect on guidelines around reproducible research. Added contributions are the verification of the reported work, a publicly available implementation and an evaluation method that is reproducible. Reproducibility is one of the corner-stones of scientific methodology. A claim made in a scientific publication should be verifiable and the described method should provide enough detail to allow replication, ‘reinforcing the transparency and accountability of research processes’ (Levin et al., 2016, p. 129). The Open Science movement has recently gained momentum among publishers, funders, institutions and practicing scientists across all areas of research. It is based on the assumption that promoting ‘openness’ will foster equality, widen participation, and increase productivity and innovation in science. Re-usability is a keyword in this context: data must be ‘useful rather than simply available’ (Levin et al., 2016, p. 133), with a focus on facilitating the advancement of knowledge based on previous work (spot check to avoid repeating work) rather than on verifying the correctness of previous work. Journal articles and especially conference papers have limited space for detailed descriptions of methods or algorithms. Even for only moderately complex systems there are implementation issues which are glossed over in textual descriptions. This makes articles readable and the basic method intelligible, but those issues need to be expounded somewhere, preferably in documented, runnable code. Unfortunately, intellectual property rights of universities or research institutions often limit researchers distributing their code. This is problematic since it leaves the ones reproducing the work guessing for details and makes replicating a study prohibitively hard. Copyrights on music make it hard to share music freely. MIR research often has commercial goals and focuses on providing access to commercial, popular music. It is sensible to use commercial music while doing research as well. Unfortunately, this makes it potentially very expensive to reproduce an experiment: all music needs to be purchased again and again by researchers reproducing the work. The original research also needs to uniquely identify the music used, which is challenging if there are several versions, re-issues or recordings of a similarly titled track. Audio fingerprinting techniques allow us to share unique identifiers1 but in practice this is rarely done. When sharing data together with annotations, it is best to adhere to the list of best practices given by Peeters and Fort (2012). The evaluation of research work (and most importantly of researchers) is often based on the number of articles published in ranked scientific journals or conferences. Other types of scientific products are not valued as much. The advantage of investing resources in documenting, maintaining and publishing reproducible research and supplementary material is not often obvious in the effort of prioritising and strategising research outputs (Levin et al., 2016, p. 130). Short-lived project funding is also a factor that directs attention of researchers to short-term output (publications), and not to long-term aspects of reproducible contributions to a field. In short there is no incentive to spend much time on non-textual output. Reproducing works is not an explicit tradition in computer science research. In the boundless hunt to further the state-of-the-art there seems no time or place for a sudden standstill and reflection on previous work. Implicitly, however, there seems to be a lot of replication going on. It is standard practice to compare results of a new method with earlier methods (baselines) but often it is not clear whether authors reimplemented those baselines or managed to find or modify an implementation. Due to a lack of standardized datasets, approaches are often hard to compare directly. Reimplementation is not only resource consuming, but never gives the guarantee that the re-created code matches the antecedent down to the last detail (Peng, 2011; Mesirov, 2010). Moreover, if a replication and evaluation is done thoroughly this does not yield new findings (if all goes well). It, therefore, may be unlikely to get published. A considerable amount of work that risks remaining unpublished is not a proposition many researchers are looking forward to, expressing the tension for researchers to ‘act for the good of the community or their own’ (Nosek et al., 2015). In the social sciences the reproducibility project illustrated that the results of many studies could not be successfully reproduced (Pashler and Wagenmakers, 2012; Open Science Collaboration, 2015) mainly due to small sample sizes and selection bias, a finding that was also demonstrated in a special issue of Musicae Scientiae on Replication in music psychology (Fischinger, 2013). In these replicated studies the main problem did not lie in replicating methods. For research on complex software systems it is expected that the replicated results will closely match the original if the method can be accurately replicated and if the data are accessible. But those two conditions are hard to meet. The replication problem lies exactly in the difficulties in replicating the method and accessing the data. Once method and data are available, a statistical analysis on the behavior of deterministic algorithms is inherently less problematic than on erratic humans. Sturm (2012) showed that even if data and method are available, replication can be challenging if the problem is ill-defined and annotated data contains inconsistencies. Even if there is little doubt on the accuracy of reported results, the underlying need for replication remains. First of all, it checks if the problem is well-defined. Secondly, it tests if the method is described well and in fine enough detail. Thirdly, it tests if the data used are described well and accessible. And finally results are also confirmed. It serves basically to check if proper scientific methodology is used and solidifies the original work. Open Science doesn’t come as a set of prescriptive rules, but rather as a set of principles centred around the concept of ‘openness’, with (i) theoretical, (ii) technological/practical and (iii) ethical implications. Each scientific community needs to identify how Open Science applies to its own domain, developing ‘the infrastructures, algorithms, terminologies and standards required to disseminate, visualise, retrieve and re-use data’ (Leonelli, 2016, p. 5). A general survey on Open Science policies in the field of MIR has never been performed, so an overview of their current application and their specific declination is not clearly defined. However, the members of this community have an implicit understanding of their own methods and their common practices to spread their materials and outputs, making it possible to lay out some fixed points. Implementing Open Science policies in their full potential would change the face of science practice as we know it. But its achievement requires a profound change in how we understand our day-to-day research activities and how we carry them out, and right now we are in a situation where most researchers endorse openness yet ‘struggle to engage in community-oriented work because of the time and effort required to format, curate, and make resources widely available’ Leonelli and Ankeny (2015). At the same time, the adoption of Open Science policies is encouraged but not mandatory and the ‘variety of constraints and conditions relevant to the sharing of research materials’ creates ‘confusion and disagreement’ among researchers (Levin et al., 2016, p. 130). A recent survey of biomedical researchers in the United Kingdom (Levin et al., 2016) identified 9 external factors that affect the practice of Open Science, including the existence (or lack) of repositories and databases for data, materials, software and models; the credit system in academic research; models and guidelines for intellectual property; collaborations with industrial partners, as well as attempts at commercialization and the digital nature of research. These constraints are generally applicable across scientific domains, thus including MIR – where the aspect of commercialization emerges much earlier in the research workflow, at the level of music collections that need to be purchased. So thinking of Open Science in MIR, where systematic support of reproducibility is but one of the possible applications, is an invitation to think about openness in relation to ‘all components of research, including data, models, software, papers, and materials such as experimental samples’ (Levin et al., 2016, p. 132). An important and cross-domain side aim of Open Science is also to show the importance of ‘encouraging critical thinking and ethical reflection among the researchers involved in data processing practices’ (Leonelli, 2016, p. 3). Open Science is not only about materials and platforms, but about people: the ‘social’ is not merely ‘there’ in science: ‘it is capitalised upon and upgraded to become an instrument of scientific work’ (Knorr-Cetina, 1999, p. 29). This work replicates an acoustic fingerprinting system. This makes it one of the very few reported replication articles in Music Information Retrieval. Sturm and Noorzad (2012); Sturm (2012) also replicated MIR systems. They replicated two musical genre classification systems to critically review the systems and to challenge the reported high performances. Our aim is to highlight the reproducibility aspects of a milestone acoustic fingerprinting paper and to provide an illustration of good research practices. In doing so we will also provide an implementation to the research community, as well as solidifying the original acoustic fingerprinting research. An acoustic fingerprint is a condensed representation of audio that can be matched reliably and quickly with a large set of fingerprints extracted from reference audio. The general acoustic fingerprinting system process is depicted in Figure 1. A short query is introduced in the system. Fingerprints are extracted from the query audio and subsequently compared with a large set of fingerprints in the reference database. Finally, either a match is found or it is reported that it is not present in the database. Such acoustic fingerprint systems have many use-cases such as digital rights management, identifying duplicates (Cotton and Ellis, 2010; Six et al., 2018), audio synchronization (Six and Leman, 2015) or labeling untagged audio with metadata (Bressan et al., 2017). A generalized audio fingerprinter scheme. Audio is fed into the system, features are extracted and fingerprints constructed. The fingerprints are consecutively compared with a database containing the fingerprints of the reference audio. The original audio is either identified or, if no match is found, labeled as unknown. The requirements for an acoustic fingerprinting system are described by Cano et al. (2005). It needs to be granular, robust, reliable and economic in terms of storage requirements and computational load while resolving a query. Granular means that only a short fragment is needed for identification. Robustness is determined by various degradations a query can be subjected to while remaining recognizable. Degradations can include additional noise, low-quality encoding, compression, equalization, pitch-shifting and time-stretching. The ratios between true/false positives/negatives determine the reliability. To allow scaling to millions of reference items, an economy in terms of storage space is needed. Finally, resolving a query needs to be economic in terms of computational load. The weight of each requirement can shift depending on the context: if only about a hundred items end up in the reference database, the low storage space requirement is significantly relaxed. Acoustic fingerprinting is a well researched MIR topic and over the years several efficient acoustic fingerprinting methods have been introduced (Herre et al., 2002; Wang, 2003; Haitsma and Kalker, 2002; Ellis et al., 2011; Allamanche, 2001; Coover and Han, 2014). These methods perform well even with degraded audio quality and with industrial sized reference databases. Some systems are able to recognize audio even when pitch-shifts are present (Fenet et al., 2011; Bellettini and Mazzini, 2008; Ramona and Peeters, 2013; Ouali et al., 2014) but without allowing for time-scale modification. Other systems are designed to handle both pitch and time-scale modification at the same time for small (Zhu et al. 2010; Malekesmaeili andWard, 2013) datasets, or relatively large ones (Wang and Culbert, 2009; Six and Leman, 2014; Sonnleitner and Widmer, 2016). It is widely cited: the ISMIR paper is cited more than 750 times and more than 250 times since 2013 according to Google Scholar. This indicates that it is relevant and still relevant today. A recent study, for example, improved the system by replacing the FFT with a filter bank (Plapous et al., 2017). Another study (Coover and Han, 2014) improved its robustness against noise. It is a paper that has a very prototypical structure which presents and evaluates an MIR system. The system, in this case, is an acoustic fingerprinting system. Replicating this work, in other words, should be similar to replicating many others. The described algorithm and the evaluation method are only moderately complex and self-contained. They only depend on regularly available tools or methods. Note that this reason is symptomatic of the reproducibility problem: some papers are borderline impossible to replicate. The contributions of this article are either generally applicable or specifically about the replicated work. The specific contributions are the verification of the results described by Haitsma and Kalker (2002) and a solidification of the work. A second contribution lies in a publicly available, verifiable, documented implementation of the method of that paper.2 Another contribution is the reproducible evaluation framework. The more general contributions are a further problematization of reproducibility in MIR and guidelines to make MIR work reproducible. The paper continues with introducing the method that is replicated and the problems encountered while replicating it. Subsequently the same is done for the evaluation. To ameliorate problems with respect to replicability in the original evaluation, an alternative evaluation is proposed. The results are compared and finally a discussion follows where guidelines are proposed. As with most acoustic fingerprinting systems this method consists of a fingerprint extraction step and a search strategy. In the terminology of Figure 1 this would be the feature extraction/fingerprint construction step and the matching step. Since the last frequency band is discarded – there is no m + 1 for the last band – only 32 of the original 33 values remain. Every FFT frame is reduced to a 32 bit word. Figure 2 shows an example using a three-second audio fragment, comparing the original (Figure 2a) with a 128 kb/s CBR MP3 encoded version (Figure 2b). Figure 2c shows the difference between the two and the distance measure for this acoustic fingerprinting system: the number of places where the two binary words differ (in red in Figure 2). This distance measure is also known as the Hamming distance or the bit error rate (BER). (a) Fingerprint block of original music clip, (b) fingerprint block of a compressed version, (c) the difference between a and b showing the bit errors in black. The hamming distance or the number of bit errors is indicated in red. Figure 3 provides some more insight into the BER in two cases. In the first case a high quality query, a 128 kb/s CBR encoded MP3, is compared with the reference and only a small number of bits change. Note that there are quite a few places where the BER is zero. The other case uses a low quality GSM codec. The BER, in this case, is always above zero. 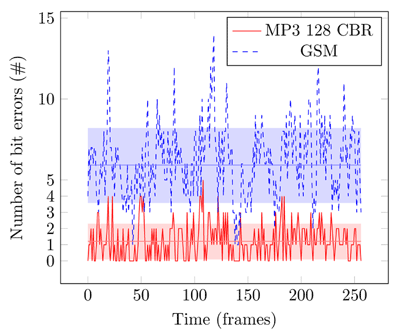 Bit errors per fingerprint for the 128 kb/s CBR encoded MP3 and the GSM encoded version of the same three seconds of audio. Both are compared to the original uncompressed version. The average and standard deviation are indicated. The original paper includes many details of the chosen parameters. It defines an FFT size, window function and sample rate, which is a good start. Unfortunately the parameters are not consistently used throughout the paper. Twice 11.6 ms is reported as the FFT step size and twice 11.8 ms. In the replicated implementation an 11.6 ms step size is used (11.636 ms = 64/5500 Hz).3 While small changes to these parameters probably only have limited effect on the overall performance of the system it is exactly these ambiguities that make an exact replication impossible. The replication, in other words, includes various assumptions on the original system which may be false. However, even under these conditions the general behavior of the system may still remain intact. Results are expected to differ but only up until a certain unknown degree. Furthermore, consistent textual description of an algorithm always leaves some wiggle room for different interpretations (Peng, 2011). Only if source code is available with details on which system – software and hardware – the evaluation is done can an exact replication become feasible. The source code could also include bugs that perhaps have an effect on the results. Bugs will, by definition, not be described as such in a textual description. This strengthens the case that source code should be an integral part of a scientific work. If interested in further details of the new implementation readers are referred to the source code in the supplementary material.4 There, it becomes clear at which precision the FFT was calculated, how exactly downsampling was done, the precision of the windowing function, and so forth. The basic principle of the search strategy is a nearest neighbor search in Hamming space. For each fingerprint extracted from a query, a list of near neighbors is fetched which ideally includes a fingerprint from the matching audio fragment. The actual matching fragment will be present in most lists of near neighbors. The details of the search strategy are much less critical than the parameters of the fingerprint extraction step. As long as a nearest neighbor search algorithm is implemented correctly the only difference will be the speed at which a query is resolved. ∑k=0d− m2(b2 k+ m)=∑k=0d− m2b!(2k+m)!(b−(2k+m))! where m = d mod 2. Once a matching fingerprint is found the next step is to compare a set of fingerprints of the query with the corresponding set of fingerprints in the reference audio. The Hamming distance for each fingerprint pair is calculated. If the sum of the distances is below a threshold then it is declared a match, otherwise the search continues until either a match is found or until the query is labeled as unknown. The parameters are determined experimentally in the original work: 256 fingerprints are checked and the threshold for the Hamming distance is 2867 bits. So from a total of 256 × 32 bits, 2867 or about 35% are allowed to be different. The implementation is done with two hash tables and a lookup table with fingerprints as key and a list of (identifier, offset) pairs as value. The identifier refers uniquely to a track in the reference database. The offset points precisely to the time at which the fingerprint appears in that track. The second hash table has an identifier as key and an array of fingerprints as value. Using the offset, the index in the fingerprint array can be determined. Subsequently, the previous 256 fingerprints from the query can be compared with the corresponding fingerprints in the reference set and a match can be verified. Implementing this search strategy is relatively straightforward. The evaluation of the system is done in two ways. First we aim to replicate the original evaluation and match the original results as closely as possible to validate the new implementation and the original work. The original evaluation is not easily replicated since it uses copyrighted evaluation audio with ambiguous descriptions, a dataset that is not available or described and modifications that are only detailed up to a certain degree. The second evaluation is fully replicable: it uses freely available evaluation audio, a dataset with creative commons music and modifications that are encoded in scripts. Interested readers are encouraged to replicate the results in full. The evaluation of the original system is done on four short excerpts from commercially available tracks: ‘O Fortuna’ by Carl Orff, ‘Success has made a failure of our home’ by Sinead O’Connor, ‘Say what you want’ by Texas and ‘A whole lot of Rosie’ by AC/DC. Unfortunately it fails to mention how long these excerpts were or where in the song they originate. In the replicated evaluation we selected 3 second fragments starting from 30 seconds into the song. The selection does have an effect on performance. If a part with little acoustic information is selected versus a dense part different results can be expected. It also fails to mention which edition, version or release is employed which is problematic with the classical piece for which many varying performances exist. The paper also mentions a reference database of 10,000 tracks but fails to specify which tracks it contains. The fact that only one excerpt from each song is used for evaluation makes the selection critical which is problematic by itself. Reporting an average performance with standard deviations would have been more informative. To evaluate the robustness of the system each short excerpt is modified in various ways. The modifications to the query are described well but there is room for improvement. For example, it is not mentioned how time-scale modification is done: there are different audible artifacts – i.e. different results – when a time or frequency domain method for time-scale modification is used. The description of the echo modification seems to have been forgotten while dry, wetness or delay length parameters are expected to have a large effect on results. To summarize: essential information is missing to replicate the results exactly. The next best thing is to follow the basic evaluation method which can be replicated by following various clues and assumptions. To this end the previously mentioned four tracks were bought from a digital music store (7 digital, see Table 1). Two were available in a lossless format and two in a high quality MP3 format (320 kb/s CBR). The test dataset can not be freely shared since commercial music is used which, again, hinders replicability. Tracks bought from 7 digital music store with 7 digital identifier and format information. The ISRC (International Standard Recording Code) and AcoustID fingerprint (https://acoustid.org) are provided as well. The original evaluation produces two tables. The first documents the bit error rates (BER, Table 2). It compares the fingerprints extracted from a reference recording with those of modified versions. If all bits are equal the error rate is zero. If all bits are different then the error rate is one. Comparison of random fingerprints will result in a bit error rate of around 0.5. The original article suggests that 256 fingerprints (about three seconds) are compared and the average is reported. Experimentally the original article determines that a BER of 0.35 or less is sufficient to claim that two excerpts are the same with only a very small chance of yielding a false positive. The BER evaluation has been replicated but due to the fact that the excerpts are not identical and the modifications also deviate slightly, the replicated BER values differ. However, if the original and replicated results are compared using a Pearson correlation there is a very strong linear relation r(58) = 0.92, p < 0.001. This analysis suggests that the system behaves similarly for the various modifications. The analysis left out the white noise condition, which is an outlier. The replicated modification probably mixed more noise into the signal than the original. Some modifications could not be successfully replicated either because they are not technically relevant (cassette tape, real media encoding) or the method to do the modification was unclear (GSM C/I). Replication of bit error rates (BER) for different kinds of signal degradations. The original results and replicated results are reported. A second table (Table 3) shows how many of 256 fingerprints could be retrieved in two cases. The first case tries to find only the exact matches in the database. The reported number shows how many of the 256 fingerprints point to the matching fingerprint block in the database. If all fingerprints match, the maximum (256) is reported. In the second case the 10 most unreliable bits are flipped resulting in 1024 fingerprints which are then matched with the database. In both cases only one correct hit is needed to identify an audio excerpt. Replication of hits in the database for different kinds of signal degradations. First number indicates the hits for using only the 256 sub-fingerprints to generate candidate positions. Second number indicates hits when 1024 most probable candidates for every sub-fingerprint are also used. Again, the original results are compared with the replicated results with a Pearson correlation. The exact matching case shows a strong linear correlation r(62) = 0.66, p < 0.001 and the case of 10 flipped bits show similar results r(62) = 0.67, p < 0.001. This suggests that the system behaves similarly considering that the audio excerpts, the modifications and implementation include differences and various assumptions had to be made. The original evaluation has several problems with respect to replicability. It uses commercial music but fails to mention which exact audio is used both in the reference database as for the evaluation. The process to generate modifications is documented but still leaves room for interpretation. Another problem is that the evaluation depends on the selection of only four audio excerpts. The ideal acoustic fingerprinting system evaluation depends on the use-case. For example, the evaluation method described by Ramona et al. (2012) focuses mainly on broadcast monitoring and specific modifications that appear when broadcasting music over the radio. The SyncOccur corpus (Ramona and Peeters, 2013) also focuses on this use-case. An evaluation of an acoustic fingerprinting system for DJ-set monitoring (Sonnleitner et al., 2016), low-power consumption on smartphones (y Arcas et al., 2017) or sample identification (Van Balen et al., 2012) needs another approach. These differences in focus lead to a wide variety of evaluation techniques for systems which makes them hard to compare. The replicable evaluation described here evaluates a fingerprint system for (re-encoded) duplicate detection with simple degradations.5 Modern fingerprinting systems are more robust to noise and pitch/time scaling. Here, however, we focus on what makes an evaluation replicable. The evaluation presented below requires only open source software and is similar to the procedure used already by Sonnleitner and Widmer (2016); Six and Leman (2014). The evaluation is done as follows. Using a script, available as supplementary material, 10100 Creative Commons licensed musical tracks are downloaded from Jamendo.6 10,000 of these tracks are added to the reference database. The remaining 100 are not. The script provides a list of Jamendo track identifiers that are used in the reference database. Using another script, 1100 queries are selected at random.7 The queries are divided into 1000 items that are in the database and 100 items that are not present in the reference database. This is to check true negatives. A query is three seconds long and starts at 30 seconds into the song. Each query is modified automatically using the modifications described above. This modification process is also automatized with SoX, a command line audio editor. Subsequently, these queries are matched with the reference database. The main parameters of the evaluation are the number of unreliable bits to flip and the threshold when a match is accepted. The number of unreliable bits to flip was set to 10. If less than 2867 bits are different between 256 subsequent 32-bit fingerprints then the match is accepted. Once the results are available each result is checked if it is either a true positive TP, false positive FP, true negative TN or false negative FN. Next to TP, FP, TN and FN sensitivity, specificity, precision and accuracy are calculated as well. Table 4 summarizes the results. As expected the system’s specificity and precision is very high. The few cases where a false positive is reported is due to audio duplicates in the reference database. The reference database does contain a few duplicate items where audio is either completely the same or where parts of another track are sampled. Note that the evaluation is done on the track level, the time offset is not taken into account. Since exact repetition is not uncommon, especially in electronic music, a query can be found at multiple, equally correct time offsets. If the system returns the correct track identifier with an unexpected offset then it is still counted as a true positive. Results on a dataset of 10k songs with 1000 queries per modification. The average Hamming distance between a modified fingerprint of 32 bits and the matching reference is reported ± one standard deviation. The sensitivity and accuracy of the system goes down when the average bit errors per fingerprint approaches the threshold of 10 erroneous bits. True positives for GSM encoded material are only found about half of the time. The average Hamming distance in bits for queries with a changed time scale of ±4% is higher than the GSM encoded queries while accuracy is much higher. This means that for the GSM encoded material the reliability information is not reliable: the 10 least reliable bits are flipped but still the original fingerprint is not found for about half of the queries. There are some discrepancies between these results and the reported results in the original study. The average Hamming distance between queries and reference is higher in the new evaluation. This is potentially due to the use of 128 kbs MP3’s during the evaluation. The original material is decoded to store in the reference database and the queries are re-encoded after modification. Another discrepancy is related to the GSM encoded queries: the original results seem to suggest that all GSM encoded queries would yield a true positive (see Table 3). This was not achieved in the replication. Whether this is due to incorrect assumptions, different source material, the evaluation method or other causes is not clear. As statistical comparison showed, the replicated system behaves generally in a similar way as the originally described system. On top of that an alternative, reproducible, evaluation showed that following the system’s design allows for functional acoustic fingerprinting. There are however unexplained discrepancies between both systems especially concerning the GSM modification. It is worrisome that it is impossible to pinpoint the source of these discrepancies since neither the original evaluation material, evaluation method, nor implementation are available. While there is no guarantee that the replication is bug free, at least the source can be checked. All in all, the results are quite similar to the original. As stated in the introduction replication of results should be expected to pose no problem. It is, however, the replication of methods and accessibility of data that makes replication prohibitively time-consuming. This could be alleviated with releasing research code and data. While the focus of the MIR community should remain on producing novel techniques to deal with musical information and not on producing end-user ready software, it would be beneficial for the field to keep sustainable software aspects in mind when releasing research prototypes. Aspects such as those identified by Jackson et al. (2011) where a distinction is made between usability (documentation, installability, etc.) and maintainability (identity, copyright, accessibility, interoperability, etc.) are relevant. Intellectual property rights, copyrights on music and a lack of incentive pose a problem for reproducibility of MIR research work. There are, however, ways to deal with these limiting factors and foster reproducible research. We see a couple of work-arounds and possibilities, which are described below. As universities are striving more and more for open-access publications there could be a similar movement for data and code. After all, it makes little sense to publish only part of the research in the open (the textual description) while keeping code and data behind closed doors, especially if the research is funded by public funds. In Europe, there is an ambition to make all scientific articles freely available by 2020 and to achieve optimal reuse of scientific data,8 though research software seems to have been forgotten in this directive. A change in attitude towards releasing more software by research institutions and public funded universities is needed. A good starting point would be updating publication policies to include software together with a clear stance on intellectual property rights. Pragmatic vs Ecological. There is a great deal of freely available music published under various creative commons licenses. Jamendo for example contains half a million CC-licensed tracks which are uniquely identifiable and can be download via an API. Much of the music that can be found there is recorded at home with limited means. This means that systems can behave slightly differently on the Jamendo set when compared with a set of commercial music. What is gained in pragmatism is perhaps lost in ecological validity. Whether this is a problem depends very much on the research question at hand. In the evaluation proposed here Jamendo was used (similarly to Sonnleitner and Widmer (2016); Six and Leman (2014)) since it does offer a large range of genres and is representative for this use-case. Audio vs Features. Research on features extracted from audio does not need audio itself: if the features are available this can suffice. There are two large sets of audio features. The Million Song Dataset (Bertin-Mahieux et al., 2011) and AcousticBrainz (Porter et al., 2015). Both ran feature extractors on millions of commercial tracks and have an API to query or download the data. Unfortunately the source of the feature extractors used in the Million Song Dataset is not available and is only described up until a certain level of detail which makes it a black box and, in our eyes, unfit for reproducible science. Indeed, due to internal reorganizations and mergers the API and the data have become less and less available. The science built on the Million Song Dataset is on shaky ground. Fortunately, AcousticBrainz is completely transparent. It uses well documented, open source software (Bogdanov et al., 2013) and the feature extractors are reproducible. The main shortcoming of this approach is that only a curated set of features is available. If another feature is needed, then you are out of luck. Adding a feature is far from trivial, since even AcousticBrainz has no access to all audio: they rely on crowdsourced feature extraction. In this article we problematized reproducibility in MIR and illustrated this by replicating an acoustic fingerprinting system. While similar results were obtained there are unexplained and unexplainable discrepancies due to the fact that the original data, method and evaluation are only partly available and assumptions need to be made. We proposed an alternative, reproducible evaluation and extrapolated general guidelines aiming to improve reproducibility of MIR research in general. 1The music metadata service MusicBrainz, for example, uses Chromaprint to assign a unique identifier to a recording, based on the audio content. 3Note that a sample rate of 5.5 kHz is used and not, as reported in the original paper, 5 kHz, to end up at the correct step size. The follow-up journal article (Haitsma and Kalker, 2003) does mention 5.5 kHz. 5If complex but repeatable audio degradations are needed the Audio Degradation MatLab toolbox by Mauch and Ewert (2013) can be of interest. 6Jamendo is a music sharing service with music shared under specific non-exclusive licenses such as Creative Commons. It can be found at https://www.jamendo.com/. 7The random function uses a fixed seed so that the evaluation can be either repeated exactly or, when given a different seed, verified with another set. 8All European scientific articles to be freely accessible by 2020 – Europe makes a definitive choice for open access by 2020 (27 May 2016, Michiel Hendrikx), see https://www.politico.eu/wp-content/uploads/2016/05/NLopenaccess.pdf. 10They also host a repository for software dealing with sound at http://soundsoftware.ac.uk. This work was partially supported by the European Union’s Horizon 2020 research and innovation programme under the Marie Skłodowska-Curie grant agreement No. 703937 and partially supported by an FWO Methusalem project titled Expressive Music Interaction. The authors would also like to thank Dr William Harwood for proofreading this article. Allamanche, E. (2001). Content-based identification of audio material using MPEG-7 low level description. In Proceedings of the 2nd International Symposium on Music Information Retrieval. Bertin-Mahieux, T., Ellis, D. P., Whitman, B., & Lamere, P. (2011). The Million Song Dataset. In Proceedings of the 12th International Conference on Music Information Retrieval. Ellis, D. P., Whitman, B., & Porter, A. (2011). Echoprint: An open music identification service. In Proceedings of the 12th International Society for Music Information Retrieval Conference. Fenet, S., Richard, G., & Grenier, Y. (2011). A Scalable Audio Fingerprint Method with Robustness to Pitch-Shifting. In Proceedings of the 12th International Society for Music Information Retrieval Conference, 121–126. Fischinger, T. (2013). Preface by the guest editor of the special issue. Haitsma, J., & Kalker, T. (2002). A highly robust audio fingerprinting system. In Proceedings of the 3rd International Conference on Music Information Retrieval. Jackson, M., Crouch, S., & Baxter, R. (2011). Software evaluation: criteria-based assessment. Knorr-Cetina, K. (1999). Epistemic Cultures: How the Sciences Make Knowledge. Harvard University Press. Malekesmaeili, M., & Ward, R. K. (2013). A local fingerprinting approach for audio copy detection. Computing Research Repository (CoRR), abs/1304.0793. Mauch, M., & Ewert, S. (2013). The audio degradation toolbox and its application to robustness evaluation. In Proceedings of the 14th International Society for Music Information Retrieval Conference, 83–88. Peeters, G., & Fort, K. (2012). Towards a (better) definition of the description of annotated MIR corpora. In Proceedings of the 13th International Society for Music Information Retrieval Conference, 25–30. Plapous, C., Berrani, S.-A., Besset, B., & Rault, J.-B. (2017). A low-complexity audio fingerprinting technique for embedded applications. Multimedia Tools and Applications, 1–20. Porter, A., Bogdanov, D., Kaye, R., Tsukanov, R., & Serra, X. (2015). AcousticBrainz: A community platform for gathering music information obtained from audio. In Proceedings of the International Society for Music Information Retrieval Conference, 786–792. Six, J., Bressan, F., & Leman, M. (2018). Applications of duplicate detection in music archives: From metadata comparison to storage optimisation – the case of the Belgian Royal Museum for Central Africa. In Proceedings of the 13th Italian Research Conference on Digital Libraries (IRCDL 2018). Available at: https://link.springer.com/chapter/10.1007/978-3-319-73165-0_10. Six, J., & Leman, M. (2014). Panako: A scalable acoustic fingerprinting system handling time-scale and pitch modification. In Proceedings of the International Society for Music Information Retrieval Conference. Sonnleitner, R., Arzt, A., & Widmer, G. (2016). Landmark-based audio fingerprinting for DJ mix monitoring. In Proceedings of the International Society for Music Information Retrieval Conference, 185–191. Sturm, B. L., & Noorzad, P. (2012). On automatic music genre recognition by sparse representation classification using auditory temporal modulations. In Proceedings of the 9th International Symposium on Computer Music Modeling and Retrieval, 379–394. Van Balen, J., Serrà, J., & Haro, M. (2012). Sample identification in hip hop music. In Proceedings of the 9th International Symposium on Computer Music Modeling and Retrieval, 301–312. Wang, A., & Culbert, D. (2009). Robust and invariant audio pattern matching. US Patent 7(627), 477. Wang, A. L.-C. (2003). An industrial-strength audio search algorithm. In Proceedings of the 4th International Conference on Music Information Retrieval, 7–13. y Arcas, B. A., Gfeller, B., Guo, R., Kilgour, K., Kumar, S., Lyon, J., Odell, J., Ritter, M., Roblek, D., Sharifi, M., & Velimirović, M. (2017). Now playing: Continuous low-power music recognition. Computing Research Repository (CoRR), abs/1711.10958.